We’d love your help. 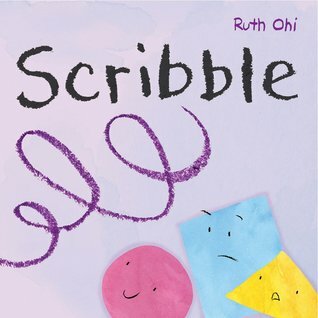 Let us know what’s wrong with this preview of Scribble by Ruth Ohi. Circle loves to roll — around and around. Solid Square likes to sit still and strong. Triangle can celebrate all her good points, and always knows which direction to go. But when Scribble suddenly dashes through their ordered world — all messy lines and energy — Circle, Square and Triangle don’t know what to think. But turns out just a zig zag here and a wavy line there are Circle loves to roll — around and around. Solid Square likes to sit still and strong. Triangle can celebrate all her good points, and always knows which direction to go. But when Scribble suddenly dashes through their ordered world — all messy lines and energy — Circle, Square and Triangle don’t know what to think. But turns out just a zig zag here and a wavy line there are all that’s needed to stir imaginations, and soon the shapes find themselves working as a team, on a course for adventure! To ask other readers questions about Scribble, please sign up. What colour is the star at the end of the book? A sheer delight! I was lucky enough to get an ARC from the local sales rep, and I am so glad that I did. In classic Ohi style this is adorable, colorful, and educational all at once. I highly recommend it for storytimes and fun times. A sweet story telling in a simplistic way that young readers will enjoy. Three shapes - Circle, Square, Triangle - are happy being what they are within their own limits. 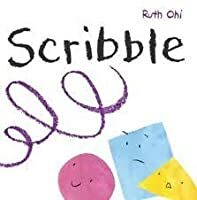 Along comes Scribble and they discover how much more creative they can be. Fun, clever, bright, surprising and satisfying ending. In a word; perfect! Circle, Square, and Triangle has opinions about the way shapes should be. When Scribble arrives with too many points but no shape, they're scared and unsure. Circle joins in playing with Scribble first and realizes what fun he can help create. It's an imaginative and relevant story. Fun and colourful, good for shapes and imagination. A simple colourful tale that reveals through one's imagination that you can be/ or do more, than one thing....that dreaming of possibilities produces endless ideas. I thought this was clever and imaginative. 2016 Cybils Picture Book Nominee. Ruth is the illustrator of over 50 books, including 15 of which she also wrote. She is a graduate of the Ontario College of Art and Design. Her books have been selected for the Pennsylvania Centre for the Book's “Baker’s Dozen”, the Canadian Toy Testing Council's "Great Books", the Ontario Library Association's "Best Bets", and the Toronto Public Library's "First & Best". They have been shortli Ruth is the illustrator of over 50 books, including 15 of which she also wrote. She is a graduate of the Ontario College of Art and Design. Her books have been selected for the Pennsylvania Centre for the Book's “Baker’s Dozen”, the Canadian Toy Testing Council's "Great Books", the Ontario Library Association's "Best Bets", and the Toronto Public Library's "First & Best". They have been shortlisted for awards such as the Marilyn Baillie Picture Book, Amelia Francis Howard-Gibbons , Mr. Christie, and Blue Spruce. Plenty of pdf printables can found on her website. Printables include puppets, games and creative handouts for her latest books.